Meet the fennec fox: While it is the smallest fox in the world, the fennec fox possesses tons of cuteness and charm. With their most notable characteristic being their large ears, they are always a favorite. These pint-sized canids are extremely adaptable in their native desert environment. 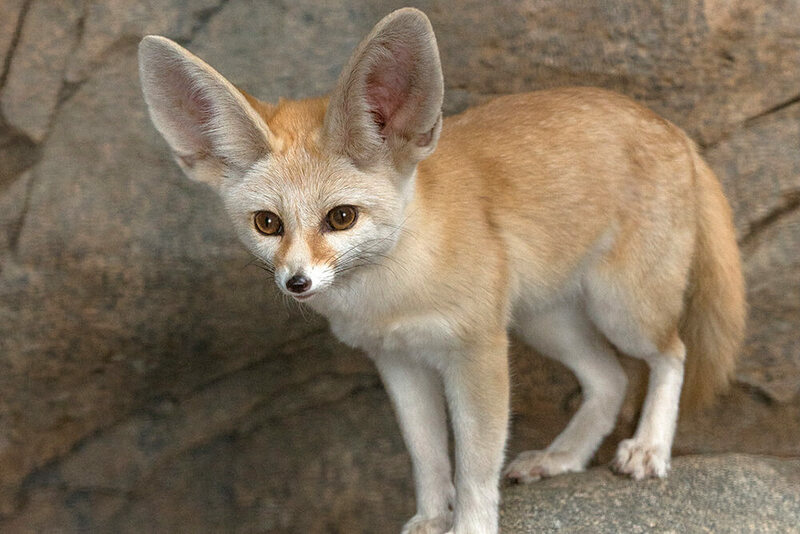 The fennecs are most recognizable by their large ears, reaching 4 to 6 inches in length. Those ears not only help them listen for prey underground, but also serve to dissipate excess heat of the desert. They have a thick, sandy-colored coat that keeps them warm at night and reflects the sunlight during the day. They even have fur on their feet that protects their footpads from the scorching ground. Safety in burrows: Humans are an ominous predator of the fennec fox, as the animals are trapped in some areas and sold into the pet trade or even hunted for their lush fur. Large diurnal predators such as birds of prey or hyenas could catch them if the foxes journey outside the burrow, so staying inside during the day is sensible for this little creature. Their nocturnal nature keeps them safe from animal predators. Their heat-reflecting coat also provides excellent camouflage in their surroundings. Fennec foxes live in deserts and semi-desert habitats. The home range of these foxes is widespread throughout the deserts of the Sahara and throughout North Africa. They burrow into sand dunes during the day, to avoid the extreme heat. These cool dens can be up to 3 feet deep. Although considered to be solitary, Fennec foxes live in small communities of around 10 individuals, with dens being close in proximity or in some cases connected to one another. Fennec foxes are mostly nocturnal animals. They spend most of the day in an underground burrow avoiding the desert heat. They emerge from their dens at dusk to begin the search for food. These foxes are omnivores, feasting on a variety of prey as nighttime hunters. They enjoy insects, rodents, snails, lizards, plants, fruits, roots, and eggs. Their large ears provide impeccable hearing to locate prey. Being desert dwellers, they have adapted to living with very little water; most of the water they need comes from the plants they consume. At the San Diego Zoo the fennec fox receives canine kibble, carnivore meat diet, and mixed vegetables. Insects are tasty enrichment items. Family starter "kit": Breeding season occurs annually in January and February, with females giving birth in March or April. Fennec foxes are monogamous and mate for life. Litters consist of 2-5 kits, after a gestation period of about 50 days. Females stay with the kits until they are weaned, after 60 to 70 days; and males venture to hunt for food for the family. Kits reach sexual maturity at 10 months old. Like other canids, fennec foxes bark, as well as whimper and whine to communicate. Like other canids, fennec foxes mark their territory by urinating around the perimeter. Fennec fox Oringo is a popular animal ambassador at the Zoo. He lives with a female named Eevee in Urban Jungle. The fennec fox is currently listed as a species of least concern, according to the International Union for Conservation of Nature (IUCN) Red List of Threatened Species. While there are no major threats to the desert-dwelling wild populations, habitat loss still occurs in their native range. They are also at risk from the illegal pet trade. In Northern Africa, they are in danger of being trapped or hunted and sold commercially. The fennec fox is one of the only carnivores that seems to do well in the Sahara desert because of its ability to survive with very little water. While their legs may not be long, fennec foxes can run 20 miles per hour. Fennec foxes' ears can be half as long as their body.